Gayle Neuman, Phil Neuman, and Cindy Markham (members of the Oregon Renaissance Band) teach a number of early music performance classes at the Community Music Center, 3350 SE Francis St. in Portland, Oregon. 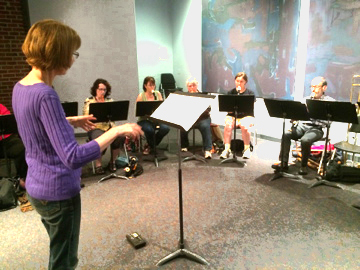 Gayle leading the Recorder 3 Class at the Community Music Center. Photo by Full Duck. The spring session classes will begin on Wednesday, April 3rd, 2019. Phil leading the Advanced Ensemble at the Community Music Center. Photo by Full Duck. Renaissance music for cornetto, sackbutts, shawms, bagpipes, and other double reeds for advanced players. We also play a modern recorder piece for fun. 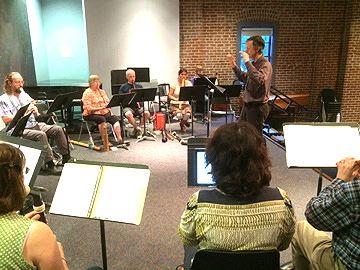 To see the CMC catalog and cost/registration information, Click here for Community Music Center Classes – scroll to current catalog and look for our classes. In addition, monthly classes are held for Early Strings in Oregon City. Private lessons are available for voice and many wind and string instruments. E-mail the Neumans at pneumantartold@gmail.com for more information. I have been playing alto recorder for 8 months with my teacher Esther but have no experience with ensemble groups. Is there a beginning class that I could take? Don’t know if I am ready for an intermediate class. Contact Cindy Markham at AAAzcool@msn.com New classes start Jan. 9th, 2019.